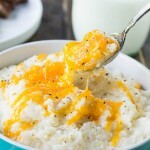 Use your slow cooker to make super easy and creamy grits. They cook while you sleep and are ready to be put on the breakfast table when you wake up. Lightly spray inside of a 6-quart crockpot with cooking spray. Stir together grits, salt and water in the crockpot. Cover and cook on LOW for 7-8 hours. Remove lid. Scatter butter on top. Use a whisk to stir the grits until they are an even consistency and the butter has melted. Sprinkle cheese on top and add pepper to taste.